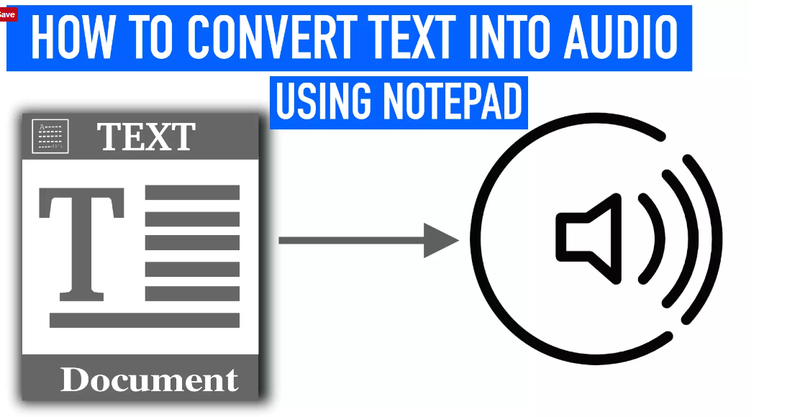 Home / HOW TO / VIDEO / How To Convert Text Into Audio Using Notepad !!! How To Convert Text Into Audio Using Notepad !!! STEP 1: Open Notepad. You can do this by searching for Notepad in the windows search Or Press Win+R and type Notepad and Press Enter. STEP 3: Now lets save the code we entered above. The code has to be saved in .vbs format rather than standard .txtformat. STEP 4: Now navigate yourself to the location where the code is stored. in my case it was stored on the desktop so i will just go to the desktop and check for it. You can see that the file we saved was in the Visual Studio Script ( vbs ) format. STEP 5: Now just double click on the saved file and Enter the text you want to hear in the text box. The moment you click OK , You can hear the text you entered as Audio. Feel free to comment your opinions down below.